We have been having incredible success in 2014 with Rapid Usability Test Sprints with companies including PayPal, AMP, Amaysim & OPSM who run these usability tests regularly to mitigate risks and make informed design decisions. They iterate designs on various projects from mobile apps to transactional websites. Rapid Recruit, Research and Results. How do we do Rapid Usability Test Sprints? While working in an agile environment, clients want to iteratively validate a concept or design. This requires customer engagement which to some people means time and money. With our Sprints the objective is to get quick feedback from real customers and put insights into actions… as quickly as within just 1 week turnaround! Formal lab setting with viewing from our special Brainstorming Room or live online with Adobe Connect. In order to make it most effective we ensure that all relevant project team members come to the session and actively participate during and after each test. When they leave for the day most UI improvement decisions have been made and our summary report becomes a checklist of things that were agreed. Have a clear research objective! Identify stimulus to test and no more then 3-5 areas of interest. Stimulus. The best part about Rapid Usability Testing is that you can get started with just about any working (or non-working) products. For the test that we conducted the concept was rather high level with no working prototype to speak of. So we did the next best thing, mobile paper prototypes! 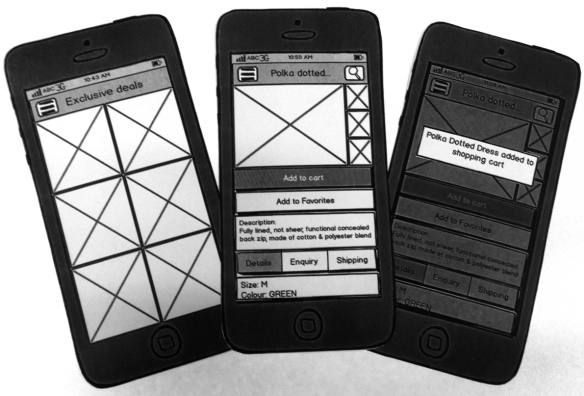 Mobile app paper prototypes that were used for Agile UX concept testing. Since the product is in its earliest stages it can literally be shaped by user expectations. What user journey are you expecting to deliver positive business outcomes? Which pages/features are of most interest? Are there specific copy, navigation or UI elements we want feedback on? Tasks were therefore created around navigation and customers filtering their search down to a specific product. This helped establish if the user journey was as smooth as intended. As with any usability test you should have specific customer segments & demographics. With rapid turn times on recruitment that might mean they need to be fairly broad specs. We use our Sydney Research Network platform to recruit people really, really quickly using social media. We’re talking about recruiting people even as quickly as 2 days before testing! If you like, we offer recruitment for your projects too. The Rapid Usability Test for this particular mobile product was done with 5 or 6 people, individual sessions in our Eye Tracking test lab (or it could have been done in a spare room at our client’s office). As with formal usability testing, a script is prepared that details each task. Keep tasks short and focused and test in about 45min sessions. This video shows how eye tracking can be used on a mobile app. We do find that eye tracking facilitates a richer Rapid Usability Test, as it allows the observers to see exactly where people are looking, or not looking, and why. It becomes very obvious when participants are having trouble getting through tasks, and validates learnings in order to begin making design decisions immediately. 1. Introduce yourself and the purpose of the test: Say hello! Explain what is about to happen. It is important to stress to the participant, that the product is being tested, not them. Tell them they are being video recorded. 2. Keep it light: It is important to put the participant at ease in order to get honest feedback. Crack a joke, be genuinely interested in the participant’s interests and have a genial approach. 3. Get them on your side: Allow participants to contribute to the product. Ask them what their solution would be to a certain issue or pain point they were having. 4. Try not to lead participants: It’s easy to get subjective about a product, especially if you are the creator! How do you feel about using it this way? How would you expect it to work? Participants open up with interesting points of view when questioned in this manner. It is also important to use silence effectively during interviews. Silence is a powerful tool that naturally prompts the interviewee to fill the void. 5. For Rapid UX Testing it is imperative that stakeholders watch and participate in vigorous discussion: It always helps when people who are involved with the product development are invited to watch tests. Not only can they provide recommendations or ‘tweaks’ between sessions (instead of after the fact), but the result is almost always a more understanding development & business team who will make key decisions soon after the testing. It also means you don’t need to write a long report that few people take the time to read. They already know what needs fixing! At the end of the day summarise the findings and, more importantly, the key updates that will be made. Objective Digital’s King St. Wharf Research Hub – design room with whitewall. of doing it. The heart of the matter is to get quick insights from real people, providing validated learnings for Rapid Results. This entry was posted in Customer Experience, Eye tracking, Eye Tracking in Sydney, Mobile eyetracking, Objective Digital, Usability testing, User Experience, User research by shogan2014. Bookmark the permalink.